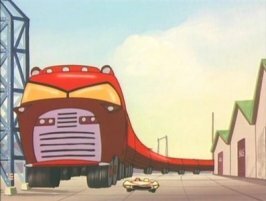 I was jazzed that the most recent Speed Racer trailer included a nod to my favorite installment of the cartoon series, a two-parter called “Race Against the Mammoth Car.” While the truck-sized vehicle attacking Racer X in the trailer is considerably less mammoth than the true Mammoth Car, it’s obviously inspired by the original. The Mammoth Car was one of the entrants in the “No Limit World Race,” and its team took the “no limit” thing to heart. Essentially a truck cab pulling ten trailers, it dwarfed the other vehicles. Before the race could begin, however, the drivers were paid a visit by Inspector Detector (seen below). I was never certain whether “Inspector Detector” was his title, or whether Mr. and Mrs. Detector urged him to enter the field of law enforcement. 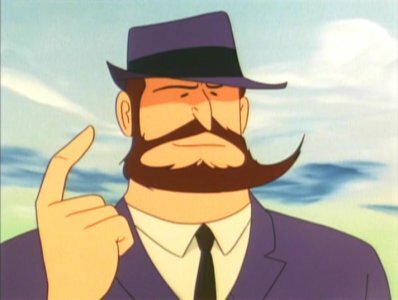 Inspector Detector’s razor-sharp beard was a vital weapon in his one-man war on international crime. The police had arrived because $50 million in gold bars had recently been stolen, and it was believed that one of the race cars would be used to smuggle it out of the country. 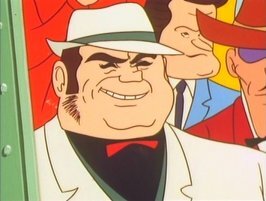 Inexplicably, suspicion immediately fell upon the Mammoth Car and its owner, gangster Cruncher Block (below, left). 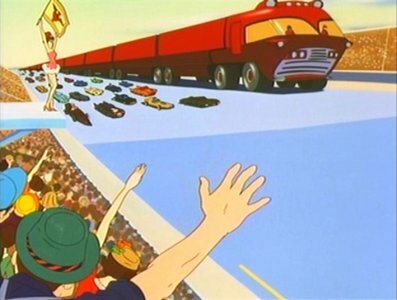 Yet a tour of the car revealed no sign of the gold, and so the race got underway. Needless to say, it wasn’t long before the Mammoth Car began smashing its competition. 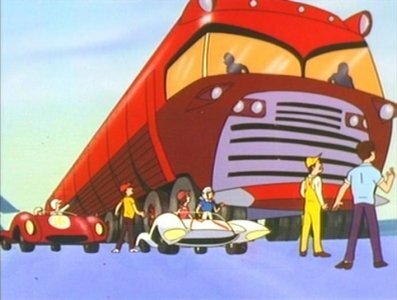 This is Speed Racer, after all, and fiery death wasn’t going to cause itself. 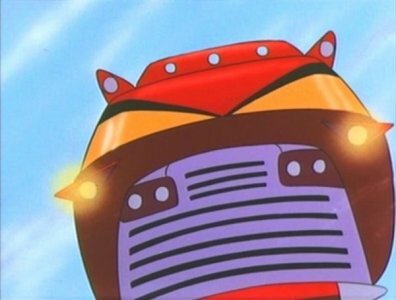 Soon, Speed himself became the target of the juggernaut after he attempted to take x-ray photos of its interior with his homing robot. Encircling the Mach 5, the behemoth belched submachine gun fire from its previously hidden gunports. Speed survived the fusillade and raced the Mammoth Car to a dead heat at the finish line. 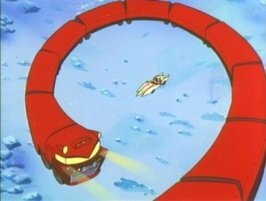 However, the monster failed to stop and continued at breakneck speed toward the pier. The chase ended in a fiery crash (what else?) as it collided with a fuel tank. And that’s when we learned that the Mammoth Car wasn’t carrying the stolen gold…it was the gold. 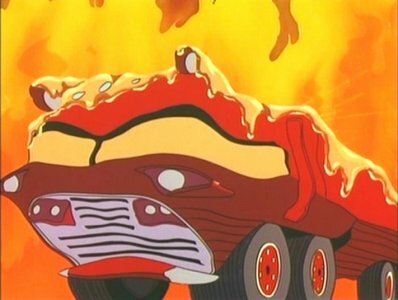 And as Cruncher’s car melted into a goopy mass, absolutely no one stopped to ponder the cost of engineering a 200-yard-long truck made of solid gold, but that’s exactly as it should’ve been.